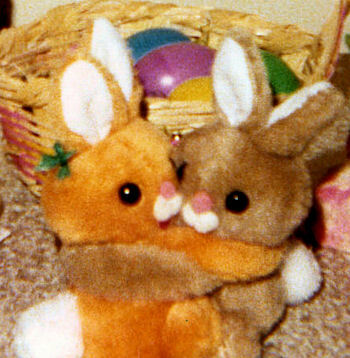 I’m looking for a pair of plush hugging bunnies (one orange, one brown) dating from approximately the late 1970s (up to possibly 1980). I don’t recall their exact height but would guess about 7-8 inches or so from the bottom to the base of their upright ears. They are apparently the “Easter-Pets” brand made by Easter Unlimited. I’d really like to find them again, since the originals were an Easter gift from my mom when I was a kid. If anyone knows where I can locate these guys, I’d greatly appreciate it. Looks similar to your bunnies.